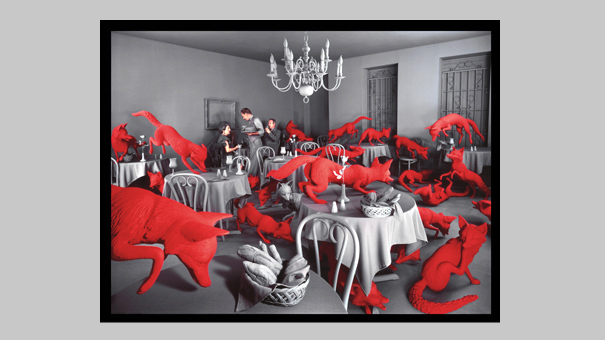 Sandy Skoglund, Fox Games, 1989. This piece was very interesting to walk around but my favorite view was from the 4th floor in the DAM, looking down over the ledge. The foxes were coming back for their children. There was one red fox (not pictured) with something in its mouth. I found the scene very dynamic and with the dominating red environment, it was easy to become involved in the scene. I see that the artists website shows an installation with the colors reversed. One other note is that the tables and chairs give this sort of proper, decorated feeling, contrasting with the wild, invisible foxes.